Learning lyrics to a song can be a time-consuming task. It can also be a task that is really challenging for some students. The repetitive nature of it can make it boring with a capital B. I know that my very heavy population of English Language Learning students find lyrics to songs difficult to remember. In the past, I have taken an approach where we repetitively sang the song over many music classes until everyone in the class had grasped the lyrics. This approach was effective at helping students to learn the songs, but I am not sure it made the experience fun for everyone involved. This year, I made a commitment to make the experience more enjoyable. Ultimately, when you are stuck on lyrics, it can be difficult to focus on all the other aspects of singing such as breath control, enunciation, and good singing technique. The first song of this school year that we have worked on learning has been our school song. There has always been one line of the song that the students have messed up and I have tried repeatedly to get them to perfect the fourth line. However, it wasn’t until I added a bit of fun to the experience that they really had it. 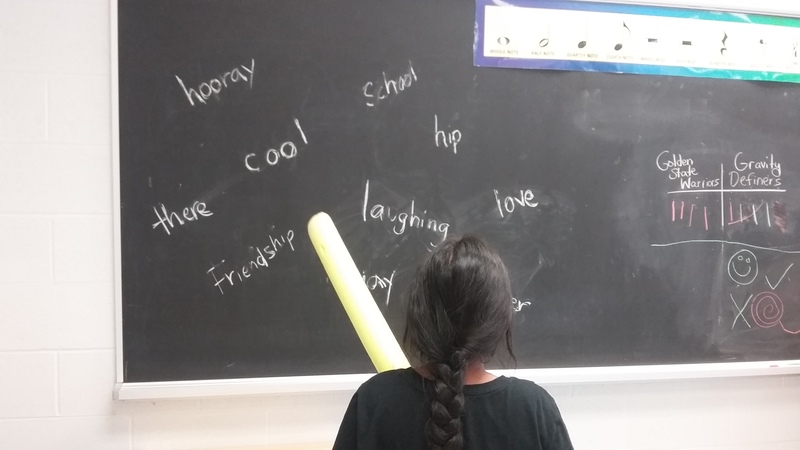 I brainstormed fun ways to learn the song before school started and lo and behold, the idea of two pool noodles and focusing on words from the song seemed to really make things work. I started by singing the whole song for the students followed by echo singing parts of the song with the lyrics posted in the classroom. I then took the lyrics away and had the students complete the missing words in the song while I sang. For example, I sang Red, Red Willow we are so _______ and the students all chimed in “cool!” when I stopped singing. After I felt that they had a solid grasp of the song, we sang the whole thing from beginning to end as well as we could. Next came the part with the pool noodles. I had volunteers come up to the front where I had words from the song scattered over each side of the blackboard. I sang the song and they had to listen closely because when I stopped singing they had to hit the next word of the song on the blackboard with the pool noodle. Students all took a turn, some individually and some as a team effort. The greatest part of this activity was that the students were really into thinking about the lyrics. We all learned the lyrics quickly and could really work on our technique in subsequent classes. One unexpected positive that came out of this game was that the students wanted to take over the teacher role. This meant that in all my classes, multiple students sang solos in the first two weeks of school. Talk about risk taking early in the school year! Making it more fun made the whole experience more enjoyable for all. Great article! I’m new to teaching music and I’ll definitely try this fun idea with my students. Good luck this year! It is such a fun subject to teach.